Much like Sulu, a.k.a. Kumar’s pal Harold, San Diego State should be prepared to put the Western division on notice that they are taking command in 2015. Of course, they also probably should have done that last year and didn’t. All that remains to be seen is if the Aztecs can take a step forward this year and claim the division title. Then, they would likely have to get past the vaunted Broncos from Boise to take the conference. Donnel Pumphrey was a first team all-conference pick last season, and after rushing for 20 touchdowns and over 1,800 yards it’s hard to argue against that pick. Pumphrey was a workhorse last season, and figure to be again this season in San Diego State’s ball control, power-run offense. A key ingredient for power-based offenses in today’s game is having multiple productive backs, though, and Chase Price provided that last season. He ought to do so again in 2015, and may take on an even bigger role. Pumphrey and Price also have three returning starters at offensive line to run behind. Oh, and all of them way over 300 pounds. There’s plenty of size up front, and RG Darrell Greene is a two-year starter, and preseason all-conference pick by many. The biggest replacement will be LT Terry Poole, who was a second team all-MWC pick. 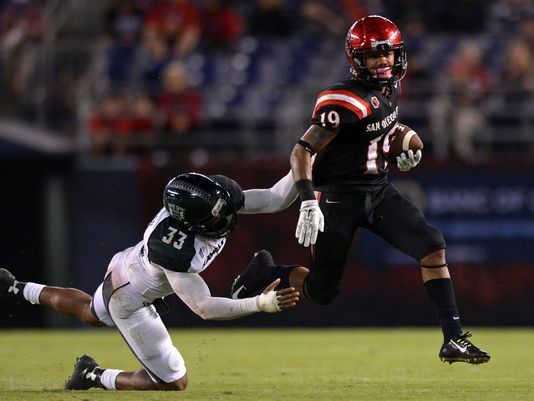 Quarterback play is one of the biggest question marks, and also one of the biggest reasons the Aztecs failed to live up to the billing last season. 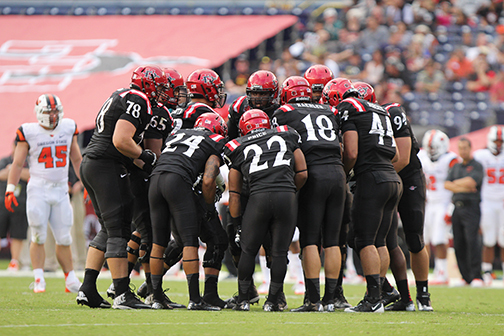 Aztec quarterbacks combined to throw four more interceptions than touchdowns last season. However, Maxwell Smith transferred from Kentucky and sat out last season, and is ready to step in and play now. Smith threw nine touchdowns to only one interception in his last season in Lexington. It also helps that Smith has two of last season’s top three receivers in terms of targets, yards and receptions back. Eric Judge and Lloyd Mills are both back. Granted, they are the only two returners to have over 200 yards receiving last season, so there is plenty of room for improvement in the receiving department. Against both the pass and the run, this should be one of the strongest defenses in the conference again this season. The Aztecs were good last year, except in the red zone. San Diego State needs to bone up in the red zone this season, and as many of you may already know that starts up front. The line returns four of their top five tacklers from last year’s line. Ends Jon Sanchez and Dakota Turner plus tackles Alex Barrett and Christian Heyward combined for 24 tackles for loss, 9.5 sacks, 2 forced fumbles and an interception last year. They should continue to wreak havoc this season with an aggressive, blitz-heavy scheme freeing up routes to the quarterback. Calvin Munson is the only major returning player at linebacker, but he is a big piece to bring back. Munson had 10.5 tackles for loss, 4 sacks and 4 interceptions by himself last season. He’s set up to perform well again this season. Jake Fely should also play more of a role this season. Fely missed all but three games last season due to both a neck injury and a dislocated wrist at different points in/before the season, but he’s healthy now and ready to be a playmaker. Secondary might be the strongest unit of the defense with the top 11 tacklers from the last season’s secondary last season. As a matter of fact only one player who actually played in the secondary last year is gone, and he only had 2.5 tackles. The corners, Damontae Kazee and J.J. Whittaker, are especially strong. They may have had only three interceptions last season, but they did break up a combined 18 passes too. Like I said in the preview, this team should be poised to take control of this division. Their biggest threats in recent memory, Fresno State and Nevada, both have more significant question marks heading into the season, and while both should be formidable, San Diego State should be the stronger team. 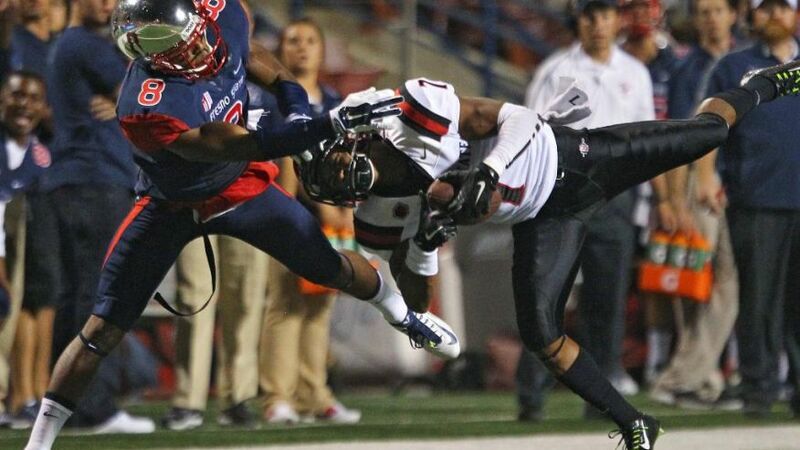 Pumphrey is a legitimate star, and the Aztecs catch both Fresno State and Nevada at home. The Aztecs also get Utah State at home, but have to travel to Colorado State on Halloween.